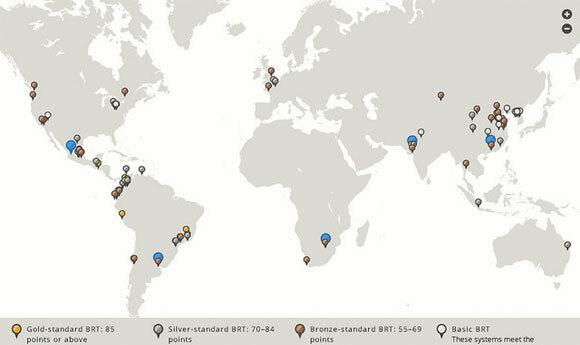 North America isn’t the only region where BRT has a lot of room to expand. Fast-growing cities across Africa, the Middle East, and South Asia could also look to BRT to provide more mobility for their citizens at a relatively low cost. The map also illustrates key examples of how individual cities have addressed the most common challenges of implementing BRT. For instance, it notes the “beautifully designed stations” along Johannesburg’s Rea Vaya line as a case study for level platforms, which eliminate stairs and thus speed bus boarding. As cities like San Francisco face similar challenges in designing and implementing their BRT systems, they can learn from other cities’ experiences. Edited to reflect that the map only shows systems certified by the BRT Standard, which may not include every system that meets the standard. Why care about ITDP? They are the bus equivalent of so-called railfans, which maybe don’t even exist, and carheads. Their specious criteria say little or nothing about how well riders’ needs are met, but reward high implementation costs, high operating costs, and taking lots and lots of precious urban street space. New York’s BRT implementations aren’t on the map either. With few exceptions, it would be over-the-top expensive to meet ITDP criteria in New York, and the marginal benefit for meeting their criteria would be slim to none. However, the BRT we have implemented has improved service a lot. Taking lots of precious urban street space is exactly how you make buses time-competitive with (and even better than) driving — the whole point of true BRT and what just about every rider will tell you is at the top of their list of priorities. I’m not sure if you’re just anti-transit or what, but their criteria do indeed have a lot to do with the quality of the ride. Yes they cost more money and take more space, but taking 95% of the space is exactly how cars got to be such a convenient mode in the first place, so this shouldn’t be surprising. If I’m anti-transit for criticizing one group, what do you make of ITDP? Their entire mission is about proliferating one mode, and they publish badly researched propaganda to the effect that other modes are bad to invest in. ITDP just wants Bogota-style BRT, damn the costs or the users’ needs. Dedicated lanes are important, but provide mobility without taking up 95% of the space. Other users matter too: pedestrians, cyclists, commercial activities. The trappings Walter Hook demands might make sense sometimes, but in many cases they may even be counterproductive. Many cities don’t have an abundance of wide corridors for completely separated busways, and the ones that do tend to be less walkable and therefore less transit-friendly.